Tokyo's skyline is dotted with many skyscrapers. And, authorities always remain on their toes during any accident or disaster. "The Tokyo Fire Department Aviation Unit" is a firefighting team specialized in aviation. A new unit named "Air Fire Rescue Task Forces" has been established In order to respond promptly to disasters caused by an earthquake directly under the capital or disasters in skyscrapers located in overcrowded urban areas. The unit will help to protect Tokyo from the risk of disasters as it is preparing to hold the Olympic Games in 2020. 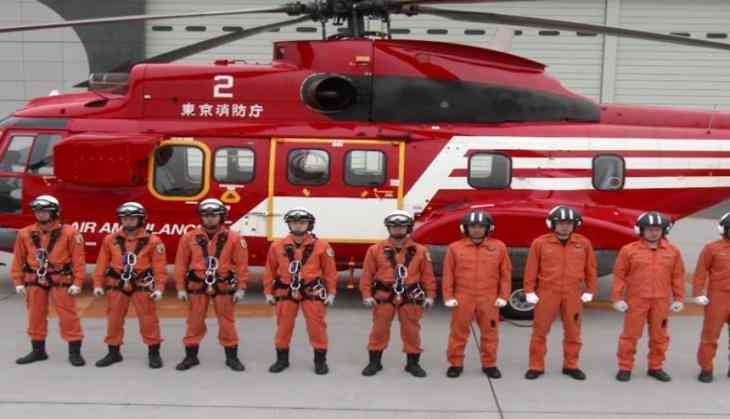 Yuji Serizawa, an official of the Air Fire Rescue Task Force, said, "Until now, we did not have special rescuers who were able to descend from a flying helicopter to carry out necessary rescue missions. Thirty years ago, we came to think that we needed a specialized aviation rescue team, but at that time, the number of our members was small. But in the year 2016, we established the "Air Fire Rescue task Force", and the number of people increased drastically. The emergency helicopter has been doing 200 to 250 flights a year and these are during normal disasters. We have not done yet activities under the name "Air Fire Rescue task Forces". And I think that being able now to send large numbers of skilled rescuers in a short time is a great progress comparing with the previous situation when we had few rescuers." "Air Fire Rescue Task Force" will move quickly and accurately, using the special helicopter. The helicopter, it is loaded with special equipment and facilities. The camera and video transmission, the rescue hoist system, the fire attacker for spray water and so on. Also, the team can rescue using some special stretchers and an emergency bag containing equipments to help the patient. Members of the unit also helped in overseas disasters. Like Bangladesh cyclone disaster, Indonesian forest fire, Sumatra-Andaman earthquake. Serizawa said, "Our helicopter has worked several times in foreign disaster areas as well. We could not go directly to the area with the helicopter from Japan, so we disassembled it, put it on the transport plane, reassembled it after arriving in the area and used it. People in the area say "Japanese are amazing". It was called "Red Angel" and they praised us very much, I heard. That people from various countries came to visit our center. They seemed to have inspected the equipment used here and the inside of the helicopter cabin. They were from Vietnam, Hong Kong, the United States and so on." Air Fire Rescue Task Force continues disaster relief not only in Tokyo, but also in countries around the world.